Matthew Hazley - celebrating a goal at Shamrock Park with Dungannon Swifts - will now be playing for Portadown. Pic by PressEye Ltd.
Portadown have secured Matthew Hazley from Dungannon Swifts - with the playmaker opting to cancel his professional contract at Stangmore Park and switch to amateur status. Hazley will be available for Niall Currie’s Ports at the end of January due to the 30-day clearance period connected to his registration. Portadown have also confirmed a return to Shamrock Park for Jaime Gardiner, a former player with the reserves, from Annagh United. 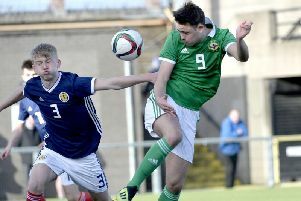 Nathaniel Ferris, a Northern Ireland youth international, will move to Annagh. Currie has now secured Jordan Lyttle, Marcio Soares, Shea McGerrigan, Adam Foley, Tiarnan Mulvenna, Gardiner and Hazley in the January transfer window. It is also understood that the Swifts have expressed strong interest in a deal for Portadown striker Mark McAllister. “Dungannon midfielder Matthew Hazley has formally agreed to join the Ports, bringing Niall Currie’s signings to six during the current transfer window,” confirmed the club website. “Hazley will be available for selection from the end of the month in accordance with his move from professional from amateur status. “Experienced Hazley will be a welcome addition to the squad over the remaining weeks of the season as the team battles to stay in the Premier League.